Tailevu manager Levani Mateia said he was happy with the team’s performance despite being disappointed with the result. 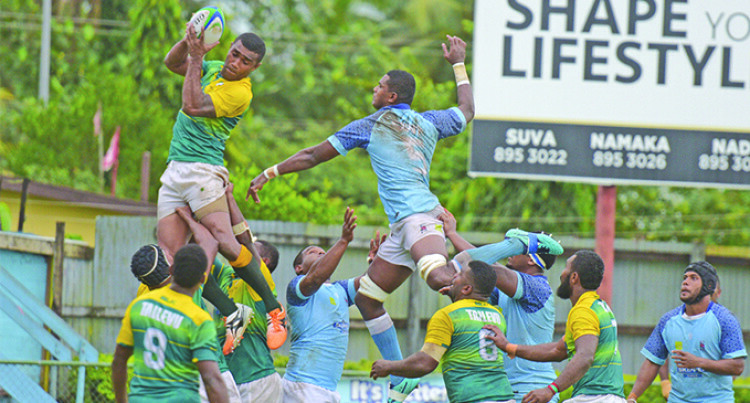 Suva assistant coach Solo Nute believes they need to improve their ball handling despite beating Tailevu 15-10 in their Skipper Cup opener at Ratu Cakobau Park, Nausori yesterday. The defending champions had to withstand periods of serious pressure but tries to winger Setareki Raoba and substitute lock forward Apolosi Tora secured them the win. Tailevu’s No. 8 Mosese Naiova and substitute loose forward hit back with tries of their own but poor kicking let the home side down. Suva opened the scoring in the 14th minute after creating space with a string of passes for winger Setareki Raoba to cross over on the left hand corner. The conversion by fullback Enele Malele was missed. Suva led 5-0. Malele then made it 8-0 to Suva with a penalty from right in front. The game was ridden with handling errors and wayward passes as both teams struggled in the wet conditions. Raoba was denied at the edge of the line by a dogged Tailevu defence on the cusp of half time as the two teams went into the break with Suva leading 8-0. Tailevu inside centre Sevanaia Rayasi missed a penalty in the 47th minute of the second half but his team continued to apply pressure after a poor clearance by Suva. It paid off in the 53rd minute when Tailevu No. 8 Mosese Naiova powered over the line to reduce the deficit, sending the home crowd into a frenzy. The conversion was missed by fullback Jone Qauqau as Suva led 8-5. Tailevu began to grow in confidence thereafter, benefiting from Suva’s repeated handling errors. Suva’s Fiji Airways Fijian Warriors trio Mesulame Dolokoto, Luke Tagi and Eroni Mawi were below par for most of the match. Qauqau again missed a penalty in 68th minute before Suva hit back Suva in the 73rd after strong running by their forward pack allowed Tora to score under the sticks. Malele converted to make it 15-5. Tailevu hit back through substitute Bukaroro in the 35th minute but Qauqau’s missed conversion meant the home side still trailed by 10-15. Suva assistant coach Solo Nute said: “We expected mistakes in the first game of the season and we will now work on them in training for the next match. Tailevu team manager Laveni Mateia said: “We are happy with the performance even though the kicking let us down.